This DVD helps to improve NEWAZA (ground techniques) thanks to the explanations and demonstration of Master OKUDA, specialist in the matter. Yoshiro Okuda is a Master of Judo at Kyushu University. Being small sized, he participated in many competitions at a time when they were no weight category in tournaments. Fighting against opponents with superior physical qualities, he developed a mastery of Newaza and became an expert in Shime waza (strangulation techniques). 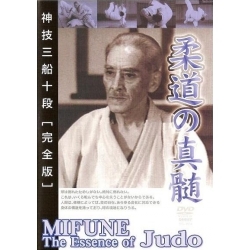 In this DVD, Master Okuda offers his many years of experience and explains usable techniques in real combat situations in a way accessible to all.